Another unpopular opinion on here but DCL isn't actually very good. He's getting a lot of credit for battling and being relatively quick because even them basics are things we don't have. He's a terrible finisher though. Has some horrible touches. He's got 1 goal in the league hasn't he? People think he might be our Harry Kane. He's a lucky boy as he's currently being compared to rooney playing on the edge of his own area and nothing. I am a fan of Koeman but he is starting to piss me off. He goes on that we are 'afraid' and have no 'aggression'! Well why don't you stop being 'afraid'! And get your selections correct- you cannot have Sig, Rooney and Klassen on the pitch at the same time and CL has to start Sun. Stop being arrogant and have some balls! How can you be a fan of Koeman? Ya..liquor laws are whack here. Beer in bars can only be 4.0% ABV (pretty popular in the states to have 6-8% beer). Liquor drinks are capped at 1.5oz per pour. To buy "full strength" beer, any wine or liquor have to go to a state-run liquor store (closed Sundays of course), only 4% beer available in the grocery store. A Xmas drinking holiday is just what the doctor ordered for the GF and I. Can't wait to sit by a roaring fire in the pub and put a few back. Wind it in. He's played about two dozen games at the top level and you're already writing him off? PS Are you gonna honour our bet? Want to know what Harry Kane was doing at same age? Being horrendous in the U20 World Cup coming back from two failed spells at Norwich and Leicester. Pretty sad this. It really tells it all. 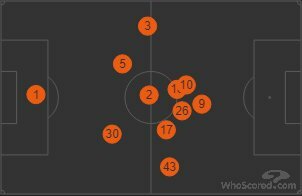 4 guys stepping on each others toes just over the mid field line with no-one even in the attacking 3rd let alone out wide deeming our full backs useless, and having absolutely no target to pass to leading the line. Pretty sad this. It really tells it all. 4 guys stepping on each others toes just over the mid field line with no-one even in the attacking 3rd let alone out wide. Worst thing about it is Ashley Williams number being on the graphic. 6 players all within 20 yards of each other. £6m a year for that?